With the Hyundai Tournament of Champions less than three months away, the tournament has announced that volunteer opportunities are still available for the 2016 event. The winners-only event returns to The Plantation Course at Kapalua Jan. 6-10, 2016 and offers a variety of opportunities to get involved and up close with some of the sport’s biggest stars. 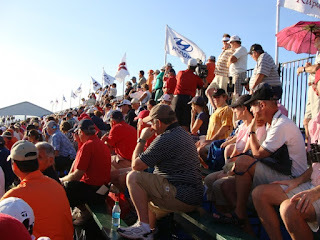 Volunteers support various on-course and behind-the-scenes aspects of the tournament, ranging from course marshals to transportation for players and tournament guests throughout the week. Volunteers are an integral part of the Hyundai Tournament of Champions and make it possible to conduct a world-class tournament. The nearly 500 men and women who volunteer their time have the unique opportunity to get close to some of the game’s best players, while making the tournament a success. Without the devoted volunteer force, the Hyundai Tournament of Champions would not have been able to distribute more than $5.3 million to charities in the Maui community since 1999. Volunteers working five shifts or more receive two uniform shirts and one cap, one weekly pass to the tournament, lunch and one complimentary round of golf at The Bay Course. Restrictions apply. Volunteers working less than five shifts, with a three shift minimum, receive one uniform shirt and cap, one weekly ticket and lunch. Two of the volunteer opportunities available are Shotlink – Laser Operator and On-Road Transportation. Shotlink – Laser Operator: volunteers will take measurements of each shot to locate the golfer’s ball using a laser device. Greenside operators require good eyesight, agility and must be comfortable working from a platform 6-10 feet above the ground. On-Road Transportation volunteers operate passenger vans to provide transportation for professional golfers, tournament sponsors and guests, volunteers and/or the general public. Those interested in volunteering can visit the event volunteer site online, or contact Adriana Fisher at Adriana.fisher@gmail.com or (808) 665-9160. The 2016 Hyundai Tournament of Champions returns to The Plantation Course at Kapalua in early January. All four competitive rounds will be broadcast on the Golf Channel.